For top quality audio on a budget, the Spirit Cassette / CD Listening Center offers outstanding stereo sound in a portable system. Educator tested and proven in libraries and classrooms. 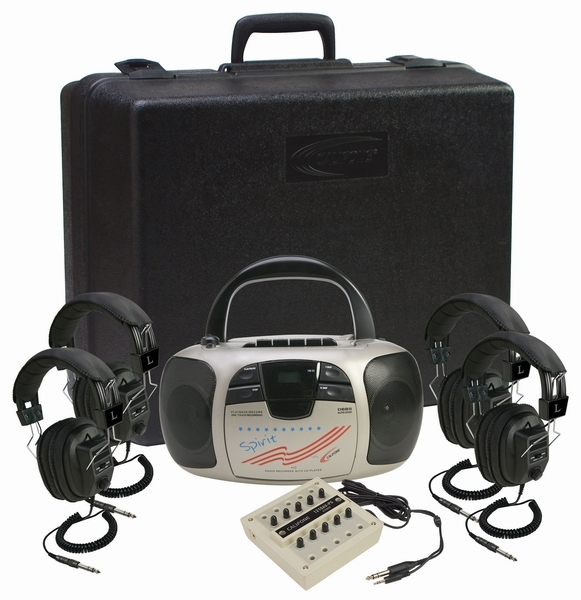 Ideal for individual and group cassette / CD listening centers, music & story-time activities, literacy groups, ELD and ESL language applications. • 1776 Spirit CD & Cassette Boom Box. • Stereo CD player, cassette player recorder. • AM/FM radio with four speakers loud enough for 40 students. • Permanently attached 5’ cord for classroom safety. • Individual volume controls for personalized preferences. • 4 3068AV Stereo Headphones. • 10 Position Stereo Jack Box (1210AVPS). • Foam-lined carry / storage case with extra room for recorded materials is ideal for itinerant teachers and roving AVcarts.